Nigeria young talented singer Timpec, released another song which he made for his Mentor PSQUARE. With the title Bring Back Psquare. After the breakup of the Psquare Brothers, All their fans both National and international have been so worried and angry. Their fans wishes were to See the Duo work together again. 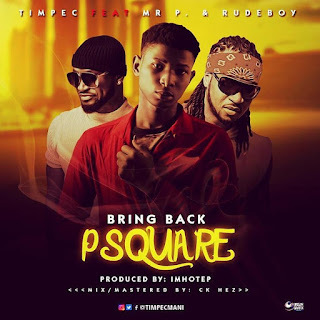 Timpec who is also a fan of the Psquare Brothers composed a song telling the twin brothers how he and the entire fans feel about theirs breakup. He also let them Kno that the Fans are eager to see them together again. Listen & Download Bring Back Psquare by Timpec Below..